Indonesia is a diverse densely-populated tropical country with an emerging economy. Some people are vulnerable to malnutrition in areas of economic deprivation. GNE sees an opportunity to help. The West Nusa Tenggara district ranks 30th out of 34 provinces on a 2016 government report on the Human Development Index. For example, studies have shown a 43-86% incidence of stunted growth and 80% incidence of vitamin A deficiency. The island of Lombok is one of these less-developed locations. 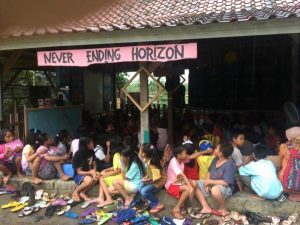 GNE has a connection through OSU with a philanthropic organization, the Jage Kastare Foundation (JKF), in the village of Ungga on Lombok. JKF consists of volunteers from the nearby Mataram University including a graduate from OSU in Community Development. They have started an after-school program for 250 students in local culture, arts and English language instruction. They are also working with parents on community health and economic development. One of GNE’s board members has been working with and supporting JKF and GNE can make a difference One way is to provide nutrition education to students and family members. Another would be to help them in securing healthy and sustainable water and food. Last year members of GNE went to Ungga to meet with JKF to discuss our programs and assess their interest. A proposal has been made to move forward with developing our General Nutrition app for the Lombok audience. GNE also helped them start a flock of ducks as a local food source. The village of Ungga is a good example of a vulnerable population at risk for malnutrition where GNE can partner with local community activists to empower them to succeed in improving health through nutrition.